Explanation: If aligned just right, even a planet can produce a glint. The above combined pictures of Mars make the red planet appear unusually elongated - Mars is really almost spherical. However, these pictures were taken when the Sun was nearly directly behind the Mars Global Surveyor (MGS) spacecraft. 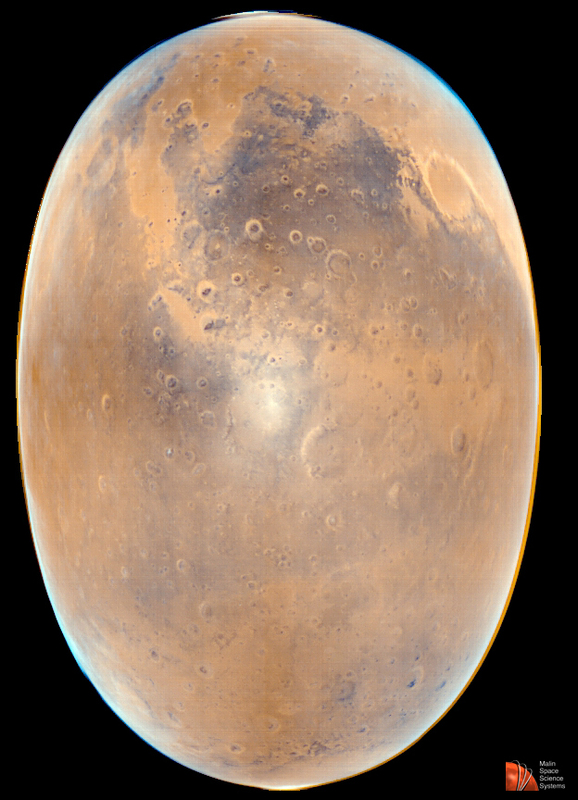 This created a view for MGS where every part of Mars that was visible was also illuminated by the Sun. From this vantage point, though, sunlight reflects off the Martian surface and atmosphere producing a bright spot in the center - a glint. The brightness, color, and extent of the glint carry valuable information about the composition and physical properties of Mars.